Thanks in large part to our advocacy, the Westside Transect is a new concept for Central Oregon that is being used to plan development on Bend’s western edge where we are at most risk of wildfire sweeping into town from the Cascade Mountain forests. On Tuesday, November 27th, 2018, Central Oregon LandWatch supported a new zone designed specifically to limit wildfire risk at a public hearing in front of the Deschutes County Board of Commissioners. The proposal is for a Westside Transect Zone that would limit development to a maximum of 187 homes on about 700 acres between the City of Bend and Tumalo Creek. This is the result of successful negotiations with the landowners of the properties to create the proposal because the alternative would be approximately 2,000 homes in the same area if it were brought into the Urban Growth Boundary at urban densities. Deschutes County will accept written comments about the Westside Transect Zone proposal until 5 p.m. Friday, Dec. 7th. Email your support for adoption of the zone zechariah.heck@deschutes.org. According to The Bulletin, Commissioners hope to have a decision before Tammy Baney’s term ends in early January, 2019. This video shows the proposed zone's location in comparison to two of the most dangerous fires in Bend's history: the Awbrey Hall Fire and the Two Bulls fire. The Transect concept is to concentrate urban-level density closer to the city's core where services and infrastructure are already available, and taper density as development approaches a high fire risk area. It also calls for better standards for design and construction, taking in to account wildlife habitat and requiring the use of fire-resistant materials and precautions for public safety. The proposed new zone in Deschutes County is a key part of Central Oregon LandWatch's decades-long effort to require more careful planning where the City of Bend and development meet forested areas. Miller Tree Farm - The Tree Farm is located on 533 acres west of Bend's city limits in Deschutes County. The property is located off Skyliners Road bordered mostly by U.S. Forest Service land and on the west by the beloved Shevlin Park. The community will consist of 50, 2-acre homesites, with the remaining 80% of the property as dedicated open space. Learn about LandWatch’s February, 2016 settlement with Brooks Resources. Westside & Shevlin UGB Expansion – Three tracts of land totaling 412 acres were brought into the Urban Growth Boundary in 2016, but have not yet been annexed into the City of Bend. LandWatch negotiated a maximum number of housing units allowed to be built in these areas (1157). Without this maximum, this area could have developed more than 5,000 new homes. Deschutes County Westside Transect Zone – The fate of the proposed zone will be decided by the Deschutes County Board of Commissioners by the end of the year. It would apply to 717 acres that are in line to become part of the City of Bend in the next UGB expansion with the potential for 2,000 or more homes. 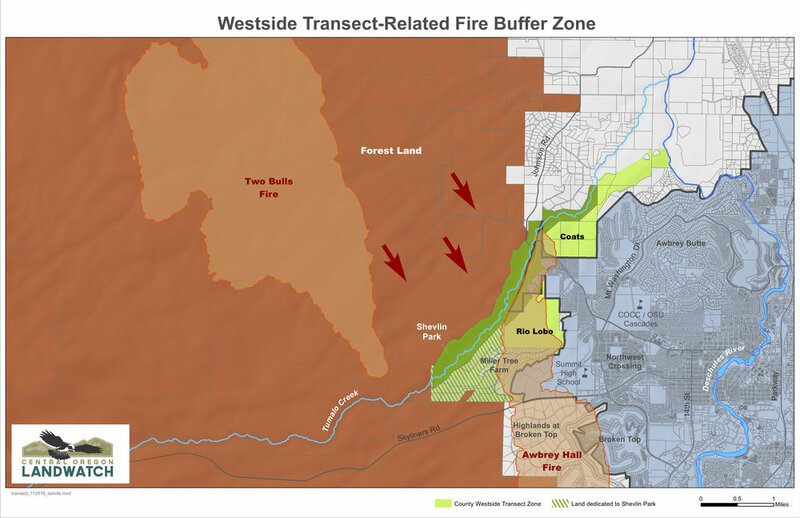 The Westside Transect Zone would limit development to a maximum of 187 homes with strict fire requirements. This type of low-density is critical for firefighting and protection.